illuminated faceplate nomenclature as part of a pleasing new industrial design. 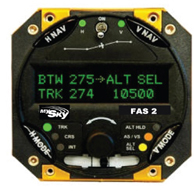 MySky FAS 2 provides excellent horizontal navigation capabilities and the vertical navigation provides altitude control, climb/descent functions with airspeed limiting, and altitude pre-select. 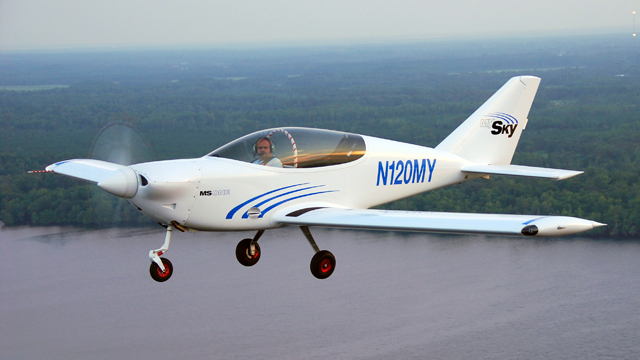 Climb/descent on airspeed is also included. MySky FAS 2 uses proven "intelligent" Gold Standard servos to assure safe and reliable control actuation. Separate MODE buttons are provided for advanced Horizontal and Vertical functions. The H MODE button allows the pilot to track a GPS flight plan, fly a specific course over the ground, or intercept a flight plan. The V MODE button may be used to specify a minor altitude adjustment, a climb/descent rate, and/or a destination altitude.